El Niño-Southern Oscillation (ENSO), better known simply as El Niño or La Niña, is normally a hot topic in the Southwest. La Niña is associated with dry winters, as we experienced most recently during 2010–2012, while El Niño winters generally are soakers. Both events occur, on average, every two to seven years, but lately not much has been happening; neutral conditions continue to dominate the tropical Pacific Ocean, leaving us to wonder what’s to come in the near and distant future. Up until recently, scientists have been unsure about what will happen to ENSO in a future warmer climate. However, over the past several months a couple of papers have been published arguing that we do know what will happen: El Niños will be more frequent and the patterns they drive—such as more rain in the Southwest—more intense. Before we delve into the details of the studies, let’s review briefly the mechanics of ENSO (see ENSO summary). During normal, “neutral” conditions, winds push warm surface water from the eastern tropical Pacific Ocean westward (Figure 1). As this warm water pools in the western tropical Pacific, the hot surrounding air rises, condensing into clouds and leading to rain. This air then travels east, where it descends off the coast of South America, leaving the air at the surface dry. Figure 1: The tropical Pacific Ocean during ENSO neutral conditions. Colors indicate sea surface temperatures. Photo courtesy of the Climate Prediction Center at NOAA. During La Niña events the winds driving this circulation pattern intensify, which strengthens the whole cycle, yielding even warmer water in the western tropical Pacific and cooler water in the east. In contrast, during El Niño events, the winds slacken and the warm water sloshes back towards the east, leading to convection (clouds and storms) in the central and eastern tropical Pacific. As a result, wet conditions hit some regions such as the Southwest U.S. and coastal Peru and Ecuador, while dry conditions settle over other parts of the globe such as Australia. Now that we’ve had the elevator speech version of ENSO, we can explore some new results. The authors of two new papers, published in Nature and Nature Climate Change, used the most up-to-date climate models to determine any future changes to ENSO. The Nature paper, published in October, found most of the climate models agree that by the mid- to late 21st century the patterns driven by El Niño—wetter winters in the southwestern U.S. and drought in Australia, for example—will become more intense. In other words, we could see even more rain and flooding in the Southwest. These findings are profound because this agreement among climate models regarding future ENSO variability hadn’t occurred before. Another paper, published in January in Nature Climate Change, also found agreement among climate models, but this time in terms of the frequency of extreme El Niño events, like the ones that occurred in 1982–1983 and 1997–1998. The authors argue that as the climate warms, the eastern tropical Pacific Ocean will warm faster than the surrounding waters, increasing the occurrence of convection in the eastern ocean—in other words, making El Niño events more frequent. In fact, the models show extreme El Niño events will double by the end of this century. Now, you may be thinking, “More frequent and intense El Niños is great news—we can always use more rain in the Southwest!” That‘s partly true. But we have to remember that the extreme El Niño in 1982–1983 led to severe flooding in the region (Figure 2), and while we may see more rain, Australia may see less, exacerbating severe drought conditions. 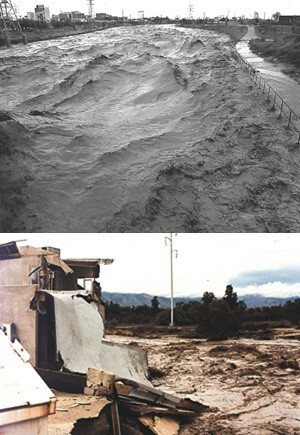 Figure 2: Flooding in October 1983 in Tucson, AZ. Top panel: Santa Cruz River from St. Mary’s Bridge. Bottom panel: Collapsed townhouse development along the Rillito River. Photographs from USGS. What does any of this mean for the prediction of El Niño and La Niña events? Right now forecasting can, for the most part, predict events six months in advance. Can these new studies change that? They could possibly inform forecasting models, but their purpose is more for predicting events on a general, longer-term basis. However, authors of a controversial new paper, published in January in PNAS, claim they have found a way to predict El Niño and La Niña events up to one year in advance. 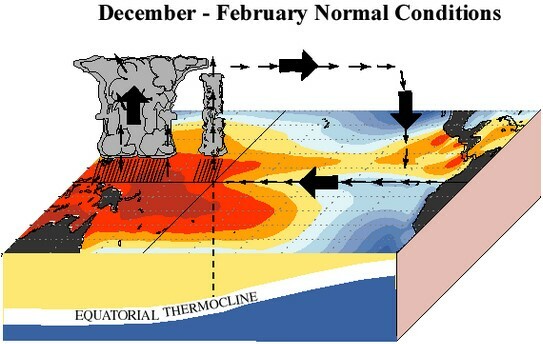 They argue that certain patterns of air temperatures over the tropical Pacific Ocean compared to the rest of the basin can be indicative of an impending El Niño event the following year. Using this scheme, they predict a 75% chance of an El Niño developing later this year. It appears that they may be correct—the Climate Prediction Center with NOAA also forecasts a similar chance of El Niño development later this summer (Figure 3). But are the authors correct because their forecasting method really works, or is it just pure luck? Figure 3: Most Climate Prediction Center models predict ENSO-neutral conditions will continue through the spring. 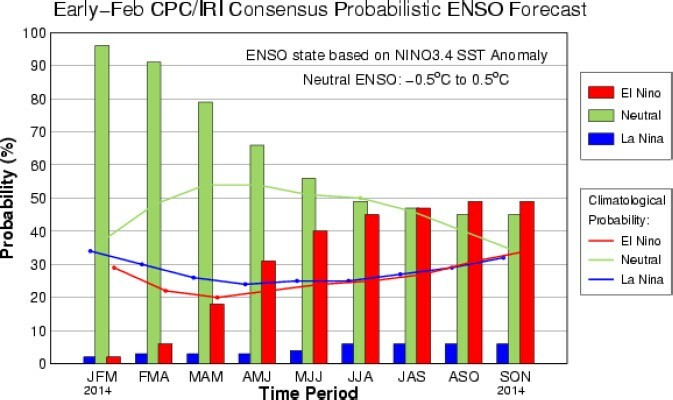 Either neutral or El Niño conditions are forecast to develop during the summer (graph from NOAA Climate Prediction Center). So we may not have extended our short-term ENSO forecasts just yet, but it does seem that we’ve learned a lot recently on how climate change may affect ENSO in the long term. Given more time, our knowledge will only grow and improve our predictive capabilities, and if current predictions are correct, we may be in for a wet winter!